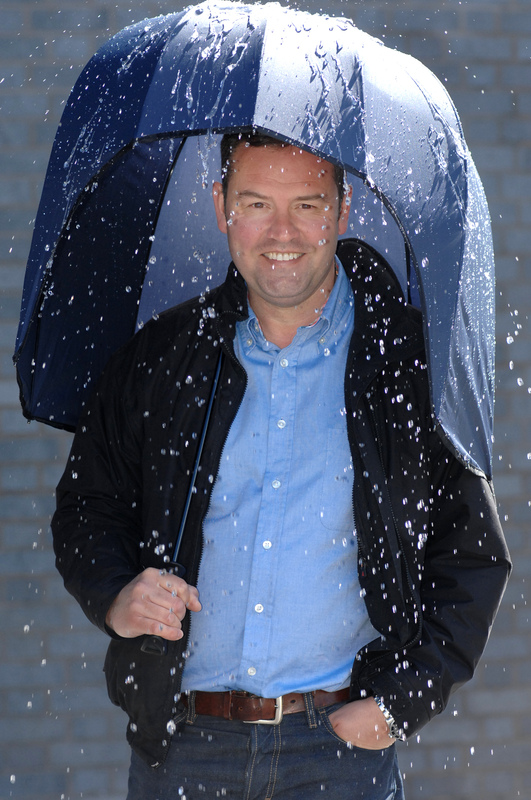 An entrepreneur whose Eureka moment came at last year’s wet and windy Grand National has reinvented the umbrella with the help of WMG at the University of Warwick. The Rainshader protects people from the elements while watching major sporting events - crucially it doesn’t blow inside out, poke passers-by in the eye or drip on neighbours’ shoulders in crowds. Its cut-away front, based on the design of a motor cycle helmet, lets people see the action while allowing the umbrella to sit low over the head so it doesn’t block the view of those behind. It is specifically designed for major sporting events and other big televised gatherings, and is fully customisable in order to offer firms a significant branding opportunity. Kenilworth entrepreneur Stephen Collier, owner of Hospitality Umbrellas, got the idea for the Rainshader while attending the Grand National 2012. He said: “It was pouring with rain, the wind was howling and I was struggling with my umbrella. I thought there had to be a better way. “Traditional umbrellas have a lot of drawbacks in busy environments as they can blow inside out and make it difficult to navigate through crowds. Mr Collier approached WMG’s SME team at the International Institute for Product and Service Innovation (IIPSI) to access expertise in new product development, particularly in the areas of user-centred design and digital innovation. Funded by the European Regional Development Fund and the University of Warwick, the International Institute for Product and Service Innovation (IIPSI) is a dedicated facility to help West Midlands SMEs access world-leading technology and expertise to develop innovative products and services. Christopher Brown, WMG Knowledge Transfer Specialist, said: ”We are very proud to support this initiative and privileged to work with Stephen’s company Hospitality Umbrellas Ltd – a company that has had the courage and conviction to get this product to market. Our support ranged from addressing design challenges through to help with protecting IP and developing the manufacturing output." Dr Xiao Ma, WMG Technology Transfer Specialist, added: "With the Rainshader we applied new and smarter approaches to develop the product, for example allowing for the mass customisation of the umbrella for various customer branding requirements and using additive manufacturing (3D printing) for prototyping purposes." Mr Collier added: “With the help of WMG, we designed a new product which we believe will soon become a fixture at all major sporting events. The Rainshader consists of a fibre glass frame, an aluminium shaft and a rubber handle. It has been tested up to Gale Force 7 without blowing inside out. It retails at £24.99 and is available at www.rainshader.com and at selected sporting and track events throughout 2013-14. The WMG SME Team is running a new product development discovery day on 16 May for West Midlands SMEs with MAS (Manufacturing Advisory Service). It will help SMEs explore a range of technologies and processes that will increase a product's chance of success.